Cooking dried beans instead of purchasing them canned gives you less sodium per serving, more flavor and better control over the texture of the finished beans, says "New York Times" food columnist Mark Bittman. Most recipes call for dried beans to be soaked in cold water overnight before cooking, though Bittman assures that this step isn't necessary. 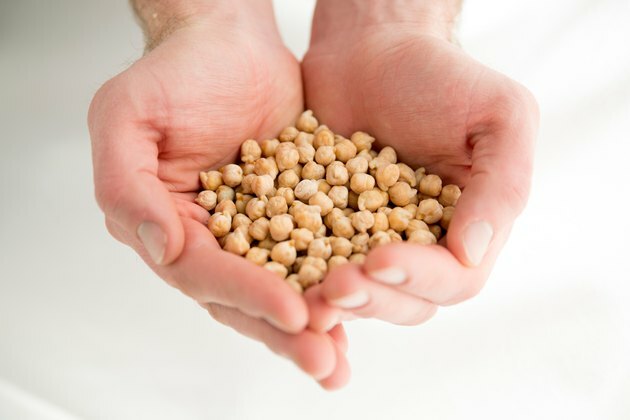 Dried chickpeas -- also known as garbanzo beans -- can be cooked without presoaking in anywhere from 40 minutes to eight hours, depending on the method that best suits your needs. 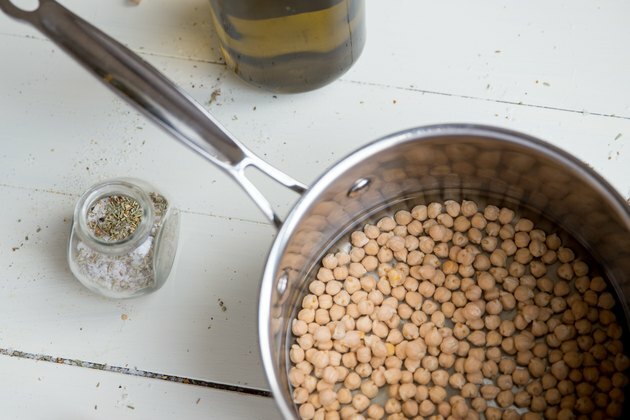 Consider presoaking chickpeas and discarding the soaking water, however, before cooking if you experience digestive problems after eating beans. 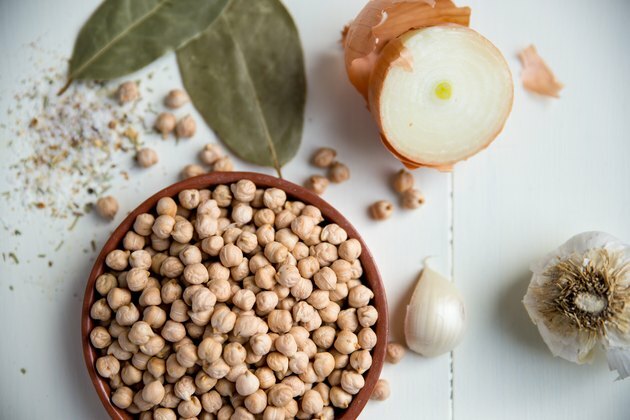 To cook dried chickpeas that haven't been soaked on the stove top, you need nothing more than water and a stockpot or large saucepan, says Bittman. Put rinsed chickpeas in the pot, add enough water to cover the beans and bring the mixture to a boil over high heat. Use a spoon to remove any foam that rises to the surface. Lower the heat so that the water is at a simmer and cook the beans, stirring them occasionally and adding in more water, if needed, until they're at your desired level of tenderness. For chickpeas, this may take around two hours. 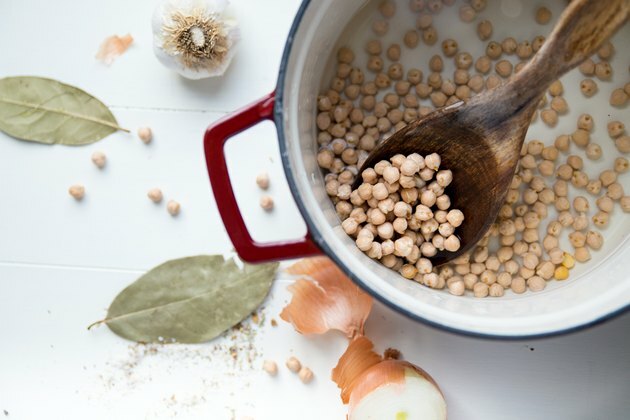 Faith Durand, the executive editor of The Kitchn website, recommends cooking dry beans in the oven along with water and your choice of seasonings, such as garlic or bay leaves. For 1 pound of dried chickpeas -- approximately 4 cups of beans -- use a Dutch oven or large pot with a tight-fitting lid. Cover the beans with about 1 inch of water, put the lid in place and bake at 375 degrees Fahrenheit. After 75 minutes, stir the chickpeas and check their tenderness. If they're not yet soft enough, return them to the oven for 15 minutes and check again. Durant says most dried beans, including chickpeas, will be done in 90 minutes to two hours when using this method. To use your slow cooker, pour the cleaned, dried chickpeas into the cooker's insert and add enough water to cover the beans by at least 1 inch, though check to be certain that the surface of the water is a few inches below the top of the insert. Cook the chickpeas for four hours on the slow cooker's high setting or between six and eight hours on the low setting. To help you estimate how long the beans should remain in the cooker, consider how you'll be using the finished beans. 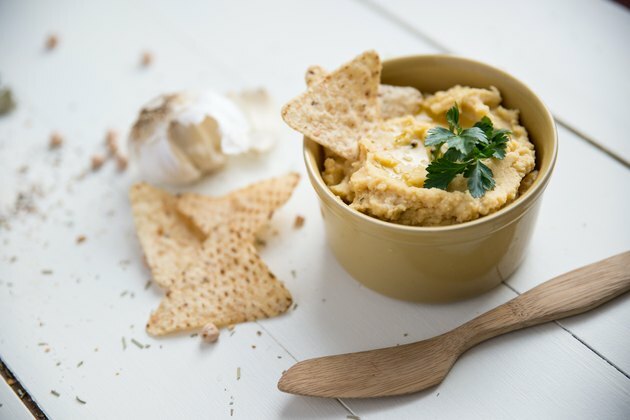 The Kitchn's recipe editor, Emma Christensen, suggests a shorter cooking time for beans you want to use in soups, stews or casseroles and the longer times for chickpeas you'll use for dips like hummus. Dried, unsoaked chickpeas can cook in approximately 35 to 40 minutes in a pressure cooker. Put the beans into the cooker, pour in enough water to cover them, add in any aromatics you may want -- garlic or onions, for instance -- and stir in a tablespoon of oil for every pound of dried chickpeas. The oil will decrease the foam that may accumulate in the cooker and interfere with the pressure valve while the beans are cooking. Turn the cooker to the high pressure setting; reduce it to medium pressure and allow the chickpeas to cook for the recommended time. Check the beans after you've turned off the heat and the pressure has decreased. If the beans are not tender enough, repeat the process for five- to 10-minute intervals.